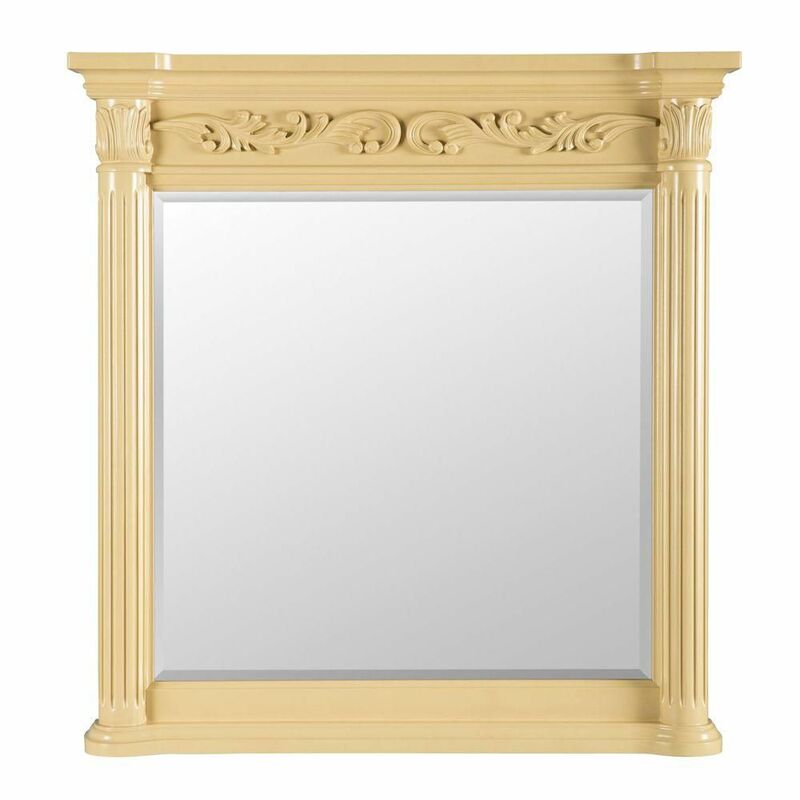 The solid-birch Pegasus Estates 36-inch x 38-inch Framed Wall Mirror in Antique White features handcarved accents. Mounting hardware included to make for easy hanging and leveling. Matches with the Estates Vanity for a coordinated look, sold separately. Solid wood frame with black finish. High quality glass to prevent rusting against bathroom humidity. Mirror dimension: 35.4Wx4.3Dx29.5H * ** * Birch* Dark * Espresso* No Assembly Required Faucet and mirror not included. Professional installation recommeneded. Solid wood mirror cabinet for storage and all wood construction on the mirror frame. Quality mirror with finish to prevent rusting against humidity in bathroom. Dimension: 8.7Sx8.7Dx23.6W * ** * Birch* walnut * No Assembly Required Faucet and mirror not included. Professional installation recommeneded. Solid wood frame with black finish, high quality glass to prevent rusting against bathroom humidity. Mirror dimension: 27.6Wx2Dx37.4H * ** * Birch* Black * No Assembly Required Faucet and mirror not included. Professional installation recommended. Accented with intricate, hand-carved detailing, the Pegasus Estates Wall Mirror in Rich Mahogany features a bevelled edge design within a decorative birch wood frame for a classical touch of luxury. It coordinates beautifully with the entire Estates collection to create a complete, matching look for your bathroom space. Designed for vertical hanging, the mirror includes a convenient wall cleat for easy installation and adjustment. Estates 38-inch L x 36-inch W Wall Mirror in Antique White The solid-birch Pegasus Estates 36-inch x 38-inch Framed Wall Mirror in Antique White features handcarved accents. Mounting hardware included to make for easy hanging and leveling. Matches with the Estates Vanity for a coordinated look, sold separately. Estates 38-inch L x 36-inch W Wall Mirror in Antique White is rated 4.7 out of 5 by 12. Rated 4 out of 5 by HomeDepotCustomer from It is really nice.. The frame is really heavy, ... It is really nice.. The frame is really heavy, need professional installation. Rated 5 out of 5 by Kshomeowner from I ordered this and had it shipped to the store. I recommend opening it at the store. The back of... I ordered this and had it shipped to the store. I recommend opening it at the store. The back of mine was totally broken off of the frame and the mirror was loose. But, thankfully not broken. The other mirror I ordered at the same time was broken in the box. Both were well packaged, but shipping is hard on them, so save the dissapointment and check them before leaving the store. The Mirror is beautiful and I would recommend it!! Rated 5 out of 5 by newnexgrillowner from Beautiful large mirror to match our vanity! At first, this mirror seemed a bit large for our bathroom, but it ended up just fitting between the lights, and we love it! It matches the vanity perfectly and is very easy to install. You install a strip of wood with a beveled edge to the wall, and the mirror has a matching beveled edge piece on the back side. This makes installation, removal, and rehanging super-easy. The funny thing is that this mirror does not come up as a suggested accessory to the vanity on the website. A mirror with a white frame is shown, and that would definitely not match the antique white of the vanity. Rated 5 out of 5 by Katydid from Beautiful Mirror I love this mirror I bought it to match the pegasus vanity and they look absolutely gorgeous together. The first mirror I ordered which I had delivered to the store in case it needed to be returned did have a crack in the wood, so another was immediately ordered and it was perfect. Rated 5 out of 5 by Feathers from Matches the vanity. An attractive peice which matches the vanity. when I first received it, thought it was a little 'over the top" Later when I got the vanity, I realized it is a good complement to the vanity. Rated 3 out of 5 by Tamdiam from Pretty but out of proportion for 36" EstatesVanity We paired this with the 36" estates vanity in snow leopard. Too bad this doesn't come in a slightly smaller size. It is a nice match for the vanity as it has the same style and finish but is definitely too large to look great. The color of the finish is a golden ivory and NOT bisque.